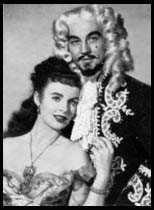 And also we want to add a special mention of a talented lady, who passed away January 18th 2001 at the age of 81, Virginia O'Brien. 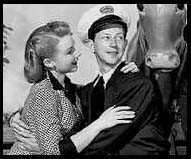 She appeared in "Francis in the Navy" as one of Peter's kissing medicos, Nurse Kittredge. Obituary. Gloria Jean appeared in five of Donald's early Universal pictures, What's Cookin', Get Hep To Love, When Johnny Comes Marching Home, It Comes Up Love and Mister Big. Like Donald, she started out in Vaudeville and entered films in the late thirties as a child star. She appeared in films until the early sixties. "Our Birthdays are the same. See, he claims to be a year younger. He has never shown me his birth certificate. He said it was lost, but I'll go with it." -- Peggy Ryan in Tap! Helena Carter appeared as Donald's love interest in Something in the Wind (as the snobby Clarissa) and in Double Crossbones. Though her career as an actress was relatively short, from 1947 to 1953, she did star in the classic, Invaders from Mars. Unfortunately, according to the IMDb, she passed away in January 2000. 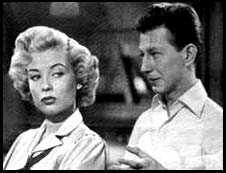 Mitzi Gaynor and Donald O'Connor appeared together in two pictures, There's No Business Like Show Business (1954) and Anything Goes (1956). In the first they played brother and sister. In the second they were romantically paired. They also worked together in a number of television specials. Mitzi is probably best known for her starring role in the musical South Pacific. A flop at the time, it is something of a cult classic now. Debbie Reynolds' first movie with Donald was, of course, Singin' in the Rain, where Gene Kelly was her romantic interest. But the next movie MGM put them in together was I Love Melvin, where Debbie was the "I" and Donald was the "Melvin". It was not such a success that MGM was tempted to ever pair them again. 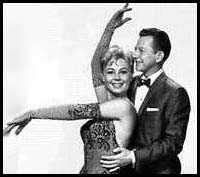 But during Debbie's long and thriving career she's worked with Donald quite a lot in television, stage shows, video and on the album, Christmas with Donald and Debbie. Debbie's Official Site. Gloria DeHaven was in two movies with Donald. 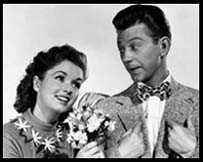 The first was, Yes Sir That's My Baby, (1949) in which they played a young married couple. Their next film wouldnot be for nearly fifty years; Out to Sea (1997). Gloria, a member of a show biz family, made her debut in the Chaplin film, Modern Times. Gloria is currently appearing in "The Palm Springs Follies" through February 11th 2001. 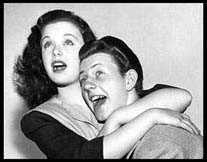 Visit JJ's Page for a little more info on Gloria DeHaven. 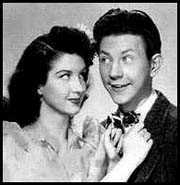 Disclaimer: We are in no way officially sanctioned by or connected to Donald O'Connor, or anyone else for that matter. None of the content of this website is meant to infringe upon any copyrights held by studios, companies, authors, other web site owners or stray individuals. No insult is intended towards, Ann Blyth, Ethel Merman, Zasu Pitts or any other lady who appeared in two or more Donald Movies, but not on this page. Some of our Valentine clip-art was provided by This Web Page. Bless their... hearts. Anything original is copyright 2000 & 2004 by Teresa and Tracy Murray (a.k.a. T'n'T).